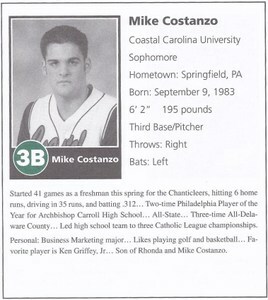 Mike Costanzo's original bio from the 2003 Big Train Souvenir Program. Mike Costanzo (BT ’03) was promoted to the Cincinnati Reds over the weekend and made his debut against the Washington Nationals making him the eighth Big Train alum to play Major League Baseball. Big Train Manager Derek Hacopian named Mike Costanzo as team MVP. Costanzo set all-time Big Train Season records with a .340 batting average and an earned run average of 0.58. A left-handed slugger from Springfield, Pennsylvania, Costanzo led the Big Train in runs scored with 25 and total bases with 55. As a right-handed hurler, he had a record of 4-1, allowing just two earned runs in 31 innings. Though all of Costanzo’s Big Train records have been surpassed in the eight seasons since his own, his mark continues to stand as his career took off the moment he came to Bethesda. He went on to play two more seasons at Coast Carolina. In those seasons he combined to hit .369/.503/.699 with 37 homers, 36 doubles, and 11 steals in 128 games. He won the Big South Conference Player of the year in both 2004 and 2005 while being Second Team All-American in 2004 and First Team in 2005. After leaving Costal Carolina to enter the 2005 First-Year Player Draft for the Major Leagues, Costanzo was taken by the Philadelphia Phillies in the second round (65th pick overall) and quickly sent to Low-A Batavia Muckdogs. Costanzo hit .274/.356/.473 with 11 home runs in Batavia which convinced the Phillies to start him off with the High-A Clearwater Threshers in 2006. That season, Costanzo hit .258/.364/.411 with 14 home runs and 33 doubles and earned himself a promotion for the next season to the Class AA Reading Phillies. In 2007, Costanzo hit .270/.368/.490 with 27 homers and 29 doubles for Reading. After that season, Costanzo was part of a deal that sent Michael Bourn to the Astros in exchange for Brad Lidge. However, Costanzo never suited up for the Astros as he was quickly dealt to the Orioles just over a month later along with Luke Scott and Matt Albers for Miguel Tejada. Though Costanzo was closer than ever to where his career took off in Bethesda, he never really got it together in the Orioles farm system. He played the 2008 season with the Class AAA Norfolk Tides, but regressed to a .261/.333/.395 with only 11 homers. That led to Costanzo starting 2009 with the Bowie Baysox. Costanzo bottom out at Bowie, hitting just .201/.292/.314 with only three home runs. The Orioles gave him one last chance at the end of that season to go back to Norfolk, but his stats were similar to those in Bowie. The Orioles cut him at the end of the season. Costanzo refused to let his major league dream die and signed to play with the Camden Riversharks of the independent Atlantic League in 2010. In just 16 games, Costanzo hit .278/.409/.556 with four homers and three doubles and caught the eye of the Cincinnati Reds organization. Splitting time between Class AA and Class AAA over the next two years, Costanzo hit .263/.347/.452 with 30 homers and 54 doubles. On Saturday, Costanzo was promoted to the Cincinnati Reds as they had no left-handed pinch hitters. Sure enough, his first at bat came in a pinch-hitting situation and he was able to drive in a run on a sacrifice fly. Costanzo became the eighth former Big Train player to make the majors. He joins John Maine (BT ’00), Bobby Livingston (BT ’01), Dirk Hayhurst (BT ’01), Steve Schmoll (BT ’00), Charlton Jimerson (BT ’99), and Michael McHenry (BT ’04), and Brian Dozier (BT ’06). McHenry (Pirates) and Dozier (Twins) are the only other active former Big Train players in the majors.